Want to give a new look to your kitchen without investing much than painting walls, molding and even the cabinets can give your kitchen a whole new look, making it appear more spacious and beautiful. It is very important to choose right color for your kitchen as it is the most visited place of your house. Right colors can turn your kitchen into a master piece and can make your cooking more fresh and vibrant. Here are some factors which you should keep in mind while selecting the right color scheme for your kitchen as the colors play a significant role in overall look of the place. Size of Kitchen: small kitchen can look bigger if you paint them with monochromatic colors , use White, light gray, blue and yellow and other light colors to paint your kitchen as these colors will help the kitchen to look bigger than actual. 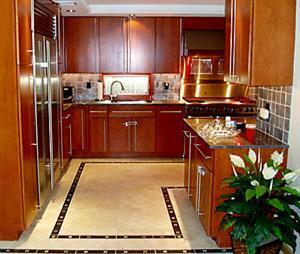 If you have a large kitchen than do not hesitate to use dark colors like purple, royal blue, cherry, brown, etc. Kitchen layout: It is good to choose light colors if you have a long kitchen as the dark colors can make your kitchen to look more congested. For square shape kitchen, paint one kitchen wall with a dark color and the rest of the walls with light shades of the same color. Lighting arrangement: If your kitchen do not have any source to get the natural light than choose bright colors as they can give you better visibility and space to your kitchen. The lighting arrangement chosen should complement the colors of the wall. Colors of kitchen and cabinets can look little different when light is reflected on it. Budget: If you have a tight budget than it s good to go for the contemporary kitchen color ideas. 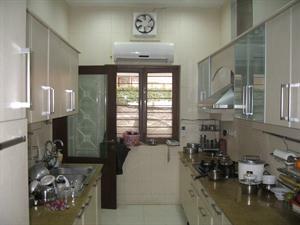 If budget is not a problem than select theme kitchens like Tuscan, Italian, Country, etc. Every Kitchen has some elements which cannot be changed or replaced like the countertop, specific curtains, appliance, cabinets furniture, so it is good to match your paint color scheme to it. Kitchen Cabinet colors: Kitchen Cabinets are the important part of your kitchen and offer you lot of storage space. Almost 50% of your kitchen is occupied with cabinets so it is good to choose your cabinet colors first before choosing other colors in their kitchen. Kitchen countertop colors: Countertops occupy a large portion of your visual space and comes in many colors and material so it good to chose the color scheme which can coordinate with the countertops of your kitchen. Stainless Steel, Bisque etc., so it is good to choose to the color scheme which highlights your kitchen appliances. Monochromatic scheme for kitchen: Paint your kitchen with light colors like white, peach, yellow etc to create a clean and neat look. Light colors can also help to look kitchen bigger than actual. You can use other colors through patterns and geometric shapes to kill the boredom of having to use just one color. Use multiple shades of a single color to create a monochromatic color scheme for your kitchen. Accented Scheme for kitchen: Want to light up your kitchen than paint your kitchen with Neutral colors such as gray, tan, taupe, magnolia, warm cappuccino or dusty blue, and cream. They can are best suited for small space kitchen which do not have good light sources. Complementary Scheme for kitchen: Under this scheme you can choose two colors which complement each other. For example paint your kitchen with red and green to achieve the complementary look. Analogous Scheme for kitchen: To use this scheme choose the colors which are next to each other on the color wheel such as lime green, lemon yellow and orange can be used to give your kitchen a bright and cheery look. Choose the colors careful as the wrong colors can destroy the whole look of your kitchen. You can give your kitchen an expensive look without expending much if you have the right colors in your kitchen. Once you finished painting the walls now it's time to choose sturdy flooring and furniture for the kitchen. We are sure with the help of these color schemes and ideas you can transform your normal kitchen into a fully new and fresher kitchen.